Myrna Wadsworth Iverson Evans, age 78, passed away peacefully on March 12, 2015, at her home in Hurricane, Utah, due to a long illness. She was born on October 4, 1936, to Carl Eugene and Leah Ballard Wadsworth in Cedar City, Utah. As the oldest of six children, Myrna spent her early childhood helping with her younger siblings, doing household chores and picking fruit on their family farm. Her parents also owned and operated the Eugene Theatre in Hurricane. She worked there selling popcorn, candy, pop and at the ticket booth. As a result, she got to watch every show that came to town and had every song in the musicals memorized. High school was a great time of life for Myrna. She was in chorus, school plays and played clarinet in the band. She danced, sang and loved life with her family and many friends. She always had a smile for everyone and a bubbly personality. Myrna married Bevan Iverson and had her first son, Robert. They later divorced and she moved to the Las Vegas area. She then married Hal Englestead and welcomed her daughter, Phyllis and another son, Mike. This was a very busy time – being a mother, working with the cub scouts, school activities, PTA and also working as a waitress at various restaurants. How she loved caring for and watching her children grow. In 1967, she was able to move her family back to her hometown of Hurricane where she held many different employment positions and enjoyed the small town she had always called home. When her children were grown, she met and married Keith “Skeeter” Evans. They loved their life together gardening, raising cattle and farming in between Skeeter’s plumbing profession. They were very charitable in many ways. They helped coordinate the Eagle’s Food Drive for the needy at Christmastime for over 15 years. They also participated in many fundraisers for organizations. Myrna had many talents and attributes. 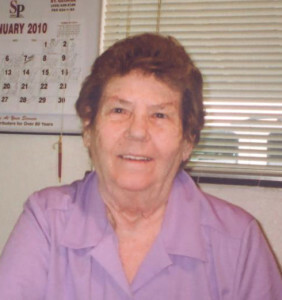 She loved to sew quilts and rag rugs and she was the greatest cook around. Her homemade jerky earned her the title of “Grandma Jerky” and her grandkids would eat it often. She was the funest Grandma ever. She was always full of compliments and encouragement. She genuinely loved her husband, family and friend. Skeeter and Myrna walked hand in hand for many years and Skeeter has cared for and supported her until her final days on earth. She will be greatly missed. Myrna is survived by her husband, Keith; son, Robert (Julie) Iverson; son, Mike Englestead; son-in-law, Gary Richins; step daughter, Stacy (Craig) Ercanbrack; step-son, Scott (Clarissa) Evans; brothers: Durward (Gwen) Wadsworth, Carl (Vanda) Wadsworth, John (Collette) Wadsworth; sister, Carolyn Henderson; her grandchildren; and great-grandchildren. She was preceded in death by her parents; a sister, Marion Wright; a brother-in-law, Bill Wright; a brother-in-law, Mike Henderson; and daughter, Phyllis Richins. Funeral services will be held Wednesday, March 18, at 11 a.m. at the Colonial LDS Chapel, 1500 South 700 West, Hurricane, Utah. A visitation will be held Wednesday, from 9-10:30 a.m. prior to services at the chapel. Arrangements have been entrusted to the care of Metcalf Hurricane Valley Mortuary, 435-635-9922. Visit the Metcalf Mortuary website for condolences, complete obituary and funeral listings.